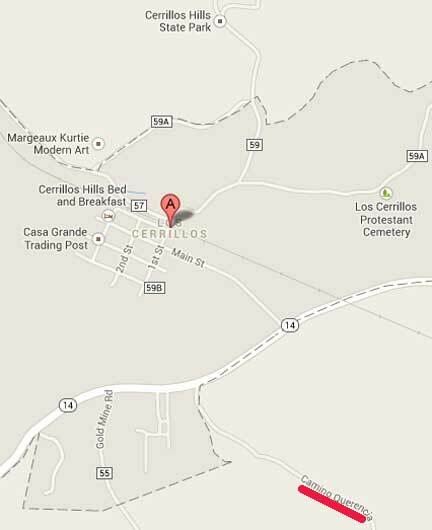 Los Cerrillos, New Mexico (Google marker) is 25 miles southwest of Santa Fe. Out Camino Querencia Road southeast of Los Cerrillos is where the two mining engineers were working at 11:45 PM Mountain time the second or third week of July 1977, when the 50 to 60-foot-diameter disc landed on its three, thin tripod legs. 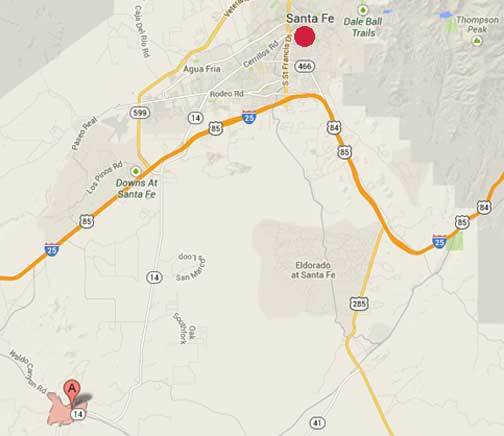 October 25, 2013 Los Cerrillos, New Mexico - Part 2 of mining engineer and pilot J. S.'s description of the close disc encounter he and his mining colleague had in the second or third week of July 1977 on Camino Querencia Road southeast of Los Cerrillos, New Mexico, about 25 miles southwest of Santa Fe.